If you found this article, you’re probably researching different ways to get your child to enjoy the dentist office (or at least not put up a big fuss). Parents and caregivers don’t want their child to throw a tantrum every time a dental check-up is needed. That is also not a good way to start their foundation of a lifetime of healthy smiles. In this article we will give you several ways to get your kids excited about their dental care. Regardless of whether they hate visiting the dentist or if you have a hard time getting them to brush their teeth, you can benefit from further reading. How often does your child floss his/her teeth? This is a very important aspect of healthy dental care for kids, but unfortunately, many parents have a hard enough time getting kids to brush their teeth. We understand and we’ll help you. Use fun colored flossers for young kids. Give them some kind of enjoyment while flossing. Don’t make flossing and brushing a chore; instead, make it fun. Let them pick out their favorite colored flosser and then guide them to floss correctly. It’s always best to start this habit of flossing at a very young age (when they get their first few teeth). Offer incentives. Fun incentives will help your son or daughter get more benefit (in addition to healthy teeth and gums) from healthy dental care habits. You can even setup a rewards system for them to make it even more fun. Use an incentive that your child enjoys, whether it’s a trip to get ice cream (choose a no sugar added ice cream, though! ), purchasing a book they’ve always wanted, etc. Share your personal dental habits with them. Help them to understand that healthy teeth and gums do not come naturally. You have to take care of them on a daily basis starting at a young age. Tell them about how you took care of your teeth growing up and how you feel comfortable visiting the dentist office now as an adult. Be a role model to them when it comes to healthy dental habits and enjoyable office visits. Let them choose their own toothbrush. 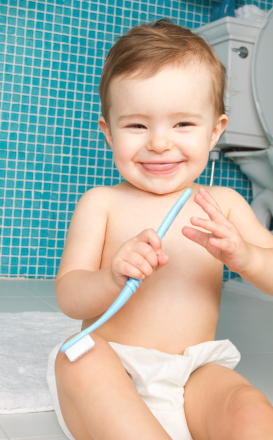 Instead of just buying your kid’s toothbrush when you’re at the store getting your things, take him or her with you. Let them choose which toothbrush they want to use. There are many types out there, including different colors, shapes, sizes, and even movie characters! Brush your teeth while they are brushing. This goes along with flossing, too. Lead by example. This is a great time for demonstrating the proper way to brush and floss (including when and how to spit into the sink). Buy a kid’s book pertaining to brushing and flossing. Kids love characters and stories. Why not combine healthy dental habits and reading? There are many books out there, so let your child choose one he or she likes. Use flavored floss and/or flavored toothpaste. Our pediatric dentists can make some recommendations regarding brands. Just ask us! If you live near one of our 3 offices in Pennsylvania, call us today. We will be more than happy to speak with your child at their first visit appointment. Our caring pediatric dentists offer services to promote healthy teeth and gums, and we’ve built an office catered to an enjoyable experience for kids! Come visit one of our offices today or call us to schedule your kid’s first dental appointment. On our website we have a complete list of all areas in PA that we serve. We look forward to meeting you and your family!